As you may have noticed, there haven’t been a whole lot of updates on Gaming Reinvented in the last few days or so. That’s because for all that time, I’ve been playing Super Mario Odyssey on the Nintendo Switch instead. Seriously, I’ve been doing everything in this game. Beating the main story, getting every Moon in sight, completing the bonus levels… heck I was so determined to finish the title I even beat Culmina Crater, the game’s Champion’s Road equivalent that’s supposed to be the hardest stage in the entire adventure. But now I’ve gotten about 860 Moons and experienced most of the game, I feel it’s time to review the experience. So how is it? How good is Super Mario Odyssey? Because Super Mario Odyssey is an incredible game. Indeed, it’s so incredible that it may well be the best 3D Mario game of all time, to the point it actually beats out both the original Super Mario 64 and Super Mario Galaxy in my eyes. So why is this? Well, let me explain, in my full review of Super Mario Odyssey for the Nintendo Switch! It’s literally what Mario fans have wanted the series to look like for years. What’s more, it’s even better than you’d expect too. Because in my opinion, the levels in the trailers for the game are actually some of the least impressive in the whole game! 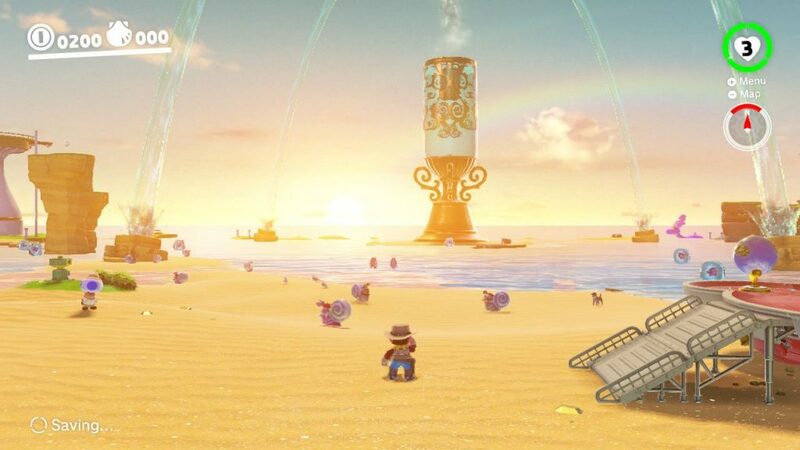 For instance, while New Donk City looks as great as a city level in a Mario game could ever be, the Sand and Cascade Kingdoms (which are also heavily advertised by Nintendo) may actually be some of the least impressive on a visual level. Instead, if you want a good look at how special the title is on an aesthetic level, you need to look no further than Bowser’s own kingdom. 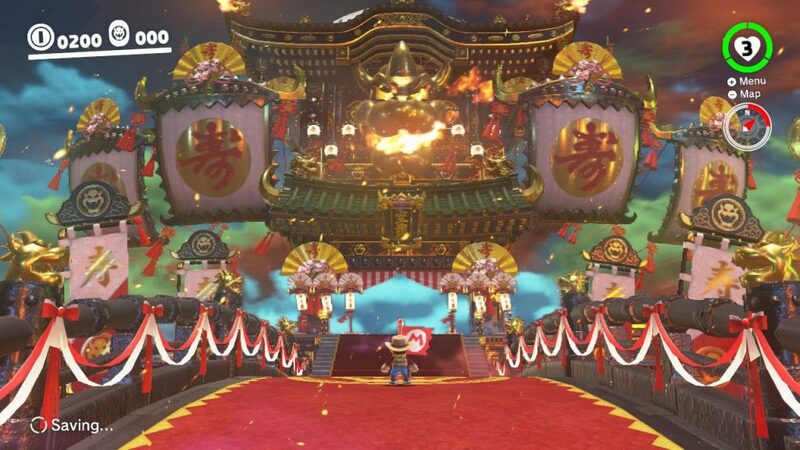 This place almost looks a million dollars, with a beautiful Japanese style that almost pops off the screen in how colourful and well animated it is. It’s an unexpected design choice for a difficult endgame level, but one which really paid off none the less. It’s absolutely stunning, and perhaps one of the best showcases the Nintendo Switch has ever received. So, on a visual level, Super Mario Odyssey is about as great as you can imagine. But what about the music and sound effects? How do they stack up? Well to be honest, it’s a mixed bag. On the one hand, where the game does music well, it really does it well. The Cascade Kingdom theme sounds incredible, as do the two vocal songs and the themes played in Bowser’s Kingdom. So, if you’re after some good music, you will find it here. There will always be at least one or two tracks you’ll remember long after you’ve stopped playing. But that seems to be it unfortunately. Cause quite a few of the other songs in the game are either fairly generic or purely made up of ambient noises. And that’s made all the more disappointing when you realise that quite a few ‘climatic’ kingdoms fall into that same boat. For instance, the final kingdom (which I won’t spoil) has almost purely ambient sound effects instead of a catchy song playing in the background. This works well thematically, but it doesn’t really suit the point in the game it’s been played in. Add on top of this a great final boss theme and an amazing set of songs in the kingdom prior, and well… you’ve got a situation where the thematically appropriate music may not have been best for the area it was actually played in. It’s a bit disappointing there really. But still, most of the songs work well enough, and the stand out pieces are truly incredible, so I’ll give it a good rating on the sound front none the less. A game with Jump Up Super Star and the Honeylune Ridge escape theme just can’t be rated less than that. Yet neither the graphics nor music would matter at all if the gameplay itself was lacking. Fortunately, Super Mario Odyssey’s gameplay is anything but. Instead, it’s pretty much exactly what 3D Mario fans have wanted for years. You’ve got giant open worlds to explore, at least a few dozen Moons to be found in each one and a huge cast of interesting characters to interact with along the way. It’s basically a return to the glory of Super Mario 64, Super Mario Sunshine and the Banjo-Kazooie series in a way only Nintendo could do. However, don’t fool yourself into thinking it’s as archaic as Yooka-Laylee here. 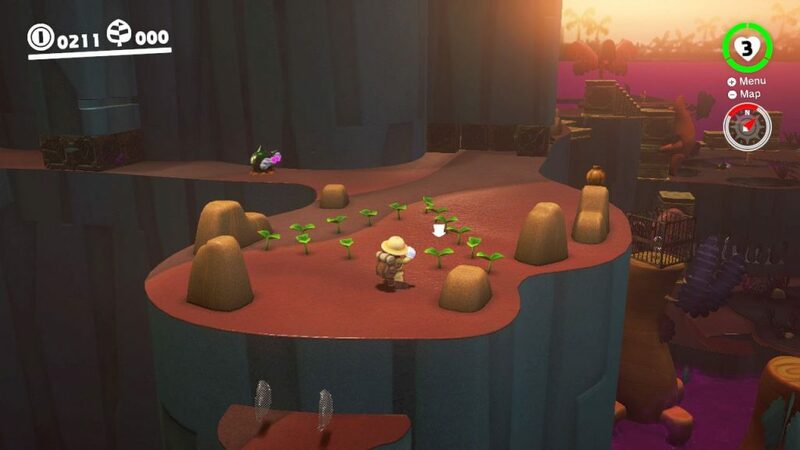 Oh no, whereas Yooka-Laylee stuck to the old days formula perhaps a little closely for its own good, Super Mario Odyssey feels like the developers learned a lot from the 20 years of progress since the N64 era. Like say, how to implement more interesting platforming challenges in said open worlds. That’s because while Mario 64 kept platforming fairly minimal (and Sunshine reduced it even further outside of the secret levels), Mario Odyssey actually merges it with the collectathon setup in a really good way. Both of them include a fair bit of platforming, with the Sand Kingdom alone having dozens of interesting areas the player can explore while doing so. It’s a nice way to mix the four-step level design of Super Mario 3D World with the collectathon setup of Super Mario 64, and works wonderfully. Other design improvements Nintendo have made here also help the 3D platformer setup as well. For instance, remember how in past games you’d get booted out of the level after every Star or Shine Sprite? Well that doesn’t happen anymore. Instead, you just continue right there and then, even if you’ve completed the last main ‘mission’ in a world. It’s a good design choice, and one which shows Nintendo clearly learnt from Rare with their games (they did the same thing in Banjo-Kazooie and Donkey Kong 64). Also changed are the lives system and collectable saving too. You see, in the older games, not only did the lives system slow you down and boot you out of the level, but it reset all the collected items as well. This meant getting red coins was a bit of a pain in certain sprawling levels, as well as that the 100-coin hunt aspect became truly painful overall. Just ask the numerous people who fell off Rainbow Ride after collecting 99 out of 100 coins if you need proof of that. Or perhaps the ones who’ve played hacks like Star Road and Last Impact (where Nintendo’s strat of grouping coins together to mitigate this wasn’t followed at all). It was an annoying system, and slowed down the game. But again, Super Mario Odyssey fixes these issues. Now lives don’t exist, and Mario merely respawns at the last door or checkpoint flag when he dies. This means the player can continue where they left off, as well as avoid finding the levels too arduous to explore because of the lives limitations. It’s a good example of modern game design catching up to the Mario series, and Nintendo realising that the old system really didn’t work that well for more difficult, harder to explore levels in the endgame. And that’s also the case with the collectable tracking too. Like in Banjo-Kazooie on Xbox Live, now collected regional coins, moon shards and berries are permanently saved when picked up. Again, it’s a useful change, and means exploring large levels becomes a hell of a lot less annoying than it was in the N64 era. So where improving the traditional 3D platformer is concerned, Odyssey excels on all levels. It’s a collectathon designed for the 21st century rather than the 20th, and significantly better as a result. But you’re not just interested in the quality of life improvements, are you? No, you’re interested in Odyssey’s biggest, most important addition. Namely, the Capture system. Yes, you know the one. 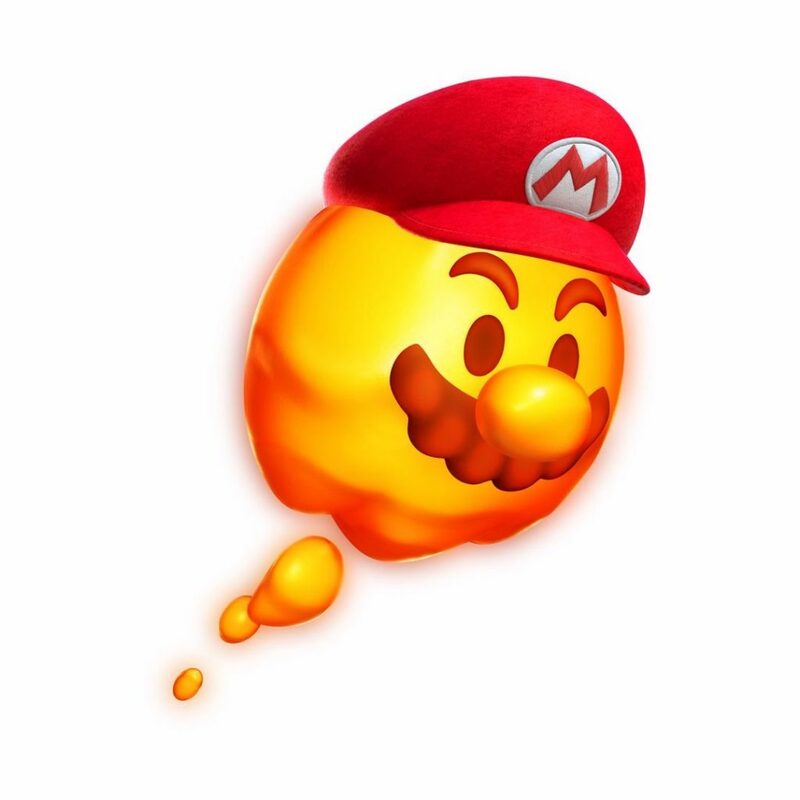 If you throw Cappy at an enemy, Mario will be able to control that enemy and use its abilities to explore the environment. It’s been well showcased in all the trailers and playthroughs of the game posted thus far. But what may not be so obvious is just how well integrated this mechanic is. Put simply, Odyssey’s Capture mechanic never feels like a gimmick at all. Instead, it feels like an integral part of the game with most of the level design being perfectly set up to accommodate it. Take the Luncheon Kingdom for example. There you can take over a Lava Bubble to swim through lava and reach new areas. Fairly generic sounding, right? Wrong! 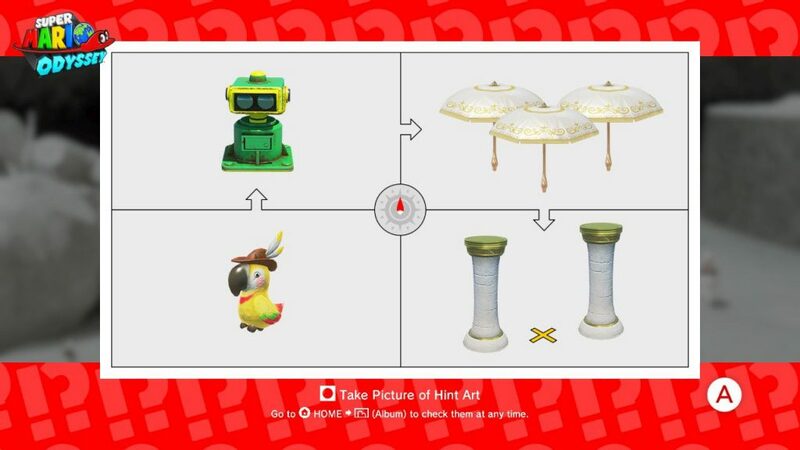 Nintendo didn’t just use the form like a key to solve a few locks here and there. Instead, they designed whole challenges based specifically on said form and its limitations. For instance, while the Lava Bubble can go across lava, it can’t go across land and will cause Mario to go back to normal if it tries. It’s a simple concept, and one that a large percentage of the level is designed around. Yet Nintendo didn’t stop there. Oh no, they also twisted the concept on its head too. That’s because with the Lava Bubble unable to go across land, they switched the roles of lava and land around for later puzzles and challenges. Now the difficulty isn’t in crossing lava pits to reach safe land as Mario, it’s about NOT touching the ground as the Lava Bubble and using the layout of what would otherwise be a deadly hazard as the main ‘walkway’. It’s an interesting setup, and one that’s used really well in the volcano cavern (where the logs you have to dodge are deadly because they turn you back to normal Mario if you land on them). And the same logic exists all over this game. Whether it’s the Pokios (woodpecker type birds that can climb walls) in Bowser’s Kingdom or the Gushens (water spraying octopi) in the Seaside Kingdom, the levels are designed to not only take advantage of their unique abilities, but to use them in ways that defy expectations. It’s absolutely brilliant level design all round. Which becomes especially apparent when you realise a rather underrated aspect of the design Nintendo did well here too. Namely, just how hard the game is to truly ‘break’ with these new mechanics. Why is this so impressive? Because on the face of it, this game should fall apart at every seam. You’ve got a version of Mario with a dozen different moves (all of which increase either his jump height or length in some way). You’ve got dozens of interesting Captures with abilities ranging from smashing through walls to full on flight. Plus, various level specific extras like the Jaxis, Mopeds and Dash Flowers. All of these are huge additions to the games, and one that an entire title could probably be designed around. They’re also theoretically all elements that could break or trivialise the entire game’s difficulty too. Yet in Odyssey… they don’t. 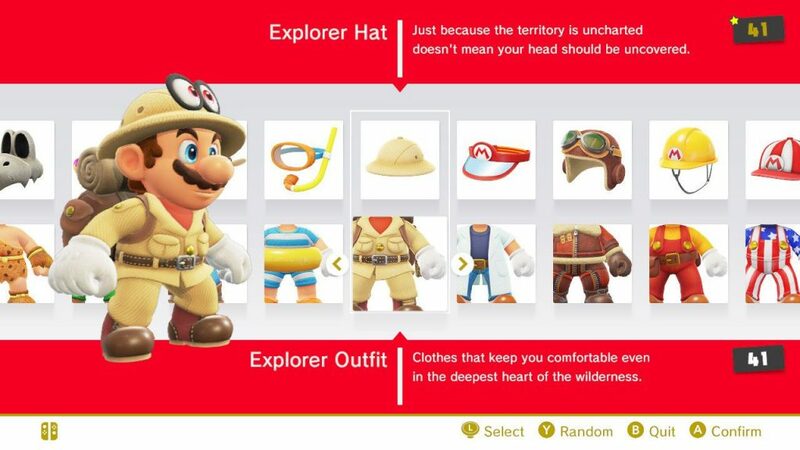 Somehow Nintendo has not only designed a world which takes full advantage of every single one of these elements, but they’ve done it in a way that means a player won’t truly break the game wide open. They’ll merely find routes and secrets that Nintendo expected them to find. It’s pretty damn impressive really, and shows that even a game with 50+ powerups can indeed utilise them all to their full potential. Which is something that unfortunately cannot be said about the costumes. That’s because while they look great, the actual concept feels rather wasted in Super Mario Odyssey. Now, don’t get me wrong here. As I said, they look great and they’re a fun thing to mess around with purely on an aesthetic level. I mean, who could possibly not laugh at the idea of Mario wearing a wedding dress or turning up to a boss battle dressed as a clown? Eh, not me that’s for sure. But at the same time, they’re never really used for anything interesting. They’re just keys for random locks throughout the game. For instance, let’s say you buy the Caveman costume from Fossil Falls. It looks interesting, but what does it actually do? Well, it tricks exactly one NPC in the game into thinking you’re a caveman, which in turn grants you a Power Moon. That’s it. It’s literally a fancy key for a single mission in the kingdom it’s found in. No new abilities, no new uses later… heck, there aren’t even any side areas in later kingdoms needing it. It’s just there for a single challenge in the game. And that’s the case with the other costumes too. They’re either used purely to start a single mission (like with the caveman, explorer or samurai outfits) or as decoration that changes a few bits of dialogue here and there. It’s a bit disappointing really. I mean, imagine if they had actual special abilities here, like the Snow Suit making you immune/resistent to freezing water or the Invisible Cap’s powers actually working on the enemies. It’d make the game much better, and incentivise players to really experiement with all the costumes the game has to offer. Still, it’s not a huge issue, and with the extensive Capture system being well implemented, it’s clear Nintendo had other better priorities here. Like making the boss battles better than any 3D Mario game prior to this. Cause let’s face it, Mario boss battles have generally sucked. Seriously, go back and play Super Mario 64 if you don’t believe me. The battles there are utterly atrocious, and so utterly devoid of challenge that a six-year-old would find it hard to lose to anything. And the same is true of many Mario games since. Yeah, the Manta Storm was a bit of a pain and Bouldergeist could cause grief on a Daredevil Run, but for a rule, the boss battles were always the weakest part of the games by far. They just weren’t interesting to play. Fortunately, that’s not the case in Super Mario Odyssey. Oh sure, the fights won’t exactly give Dark Souls a run for its money, and anyone who can beat Cuphead is going to absolutely flatten the bosses within about 30 seconds, but they’re better none the less. Now even the basic Broodal mini bosses up their attack patterns as the fights go on, with the real kingdom bosses actively adding new attacks and strategies as things move on. Things are also made better by a certain level of creativity here, whether it be in the boss designs or how the battle plays out as a whole. Sure, fighting a Wiggler isn’t too exciting. But fighting a mechanical one with a tank? That’s interesting. It’s a ‘cool’ setup that keeps you interested even with an easy and predictable boss pattern. Same goes for the Octopus boss you fight with FLUDD style jet abilities, the enormous dragon found in the Ruined Kingdom or even the easy UFO from the Wooded Kingdom. They’re all fantastic fights that keep you interested in playing, despite not actually be all that complex in terms of attack patterns or overall difficulty. So, on a boss note, Odyssey is significantly better than the 3D games before it. But it’s not perfect. Like any other game in history, Super Mario Odyssey does have a few issues. 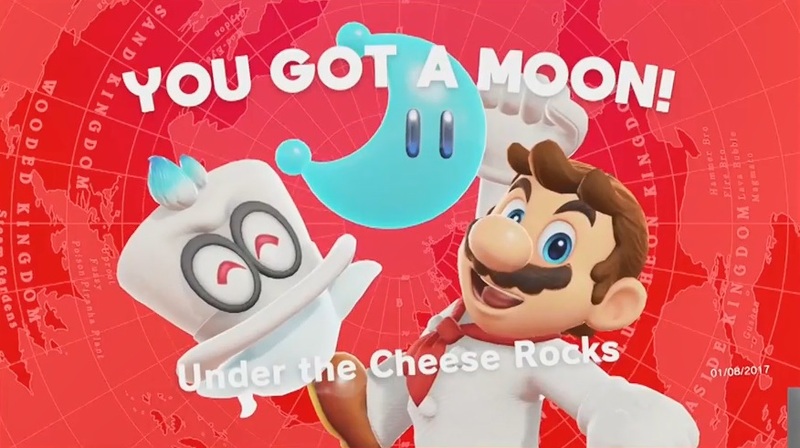 This means that a fairly large percentage of the Moons in each stage are rather predictable, which is something that’s only made worse with semi common additions like ‘play the right music for Toad’ missions and sheep herding missions. So, while the game does have well over 800 Power Moons to find and collect, it doesn’t have quite as many unique missions as you’d think it would. And things don’t change much in the bonus areas either. That’s because like with the main level formula, the setup for each bonus area is exactly the same throughout the game. Namely, there’s always one main mission Moon and one extra one hidden in the level. As a result, you eventually kind of get used to the game’s design, and start marking off missions on a checklist at a certain point in the game. It’s not a new problem for the Mario series (Sunshine had about 1/3 of its Shines locked behind collecting coins) and it’s varied up once or twice (the ice cave in Shiveria actually has three Power Moons in it for some reason), but it does take away from the variety a little as you progress. I’m also not a fan of the mini games either. They’re not the worst thing in the world, and none of them are impossible by any means, but they’re also not particularly fun either. The RC Car is annoying and awkward to control, the Bound Bowl is worse, Volleyball is either too hard or too easy based on whether you’re playing with Mario and Cappy… in other words, they’re your usual bog-standard 3D platformer mini games. And that wouldn’t be a problem if you only had to play them once. Or if the scores needed in each were extremely low. But neither is the case. Instead, you have to play these mini games at least twice each (or four times for the Bound Bowl one), with the final score needed for the Moon being rather high. Not good, especially if you’re stuck spending ten times longer on these things than the actual platforming. Even though at the end of the day, it’d almost be impossible to say this game does anything wrong here. I mean, it’s got more than 800 Power Moons for goodness sake, and enough collectables to make Mario 64 seem downright barren by comparison. Basically, there are 14 main kingdoms in the game, with 3 more unlocked in the postgame. 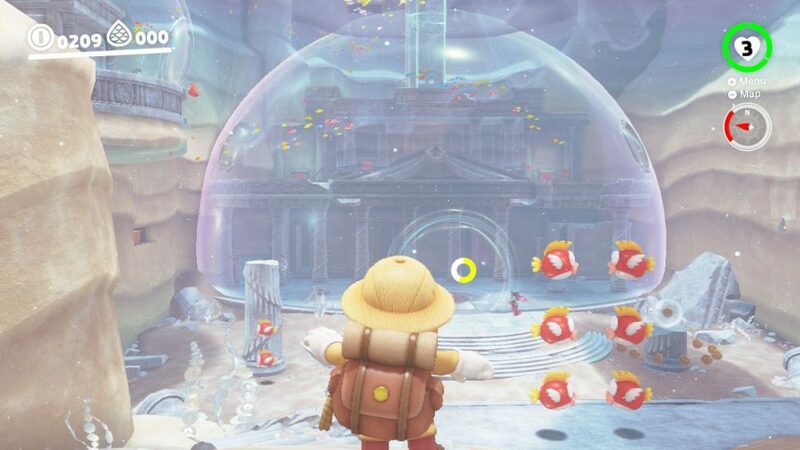 In turn, these kingdoms have between 15-70 Power Moons you can collect in the main adventure, as well as another 20 or so that get added once you beat the main story. Add this to the 100 regional coins found in each kingdom, the 100s of costume parts you can get throughout the game and numerous stickers and souvenirs to buy in shops, and you’ve got a game with almost as many things to collect as Zelda Breath of the Wild. It’s a game that’ll likely keep you going for months. This is especially true given the difficulty of some of the later areas. Yeah, the early stuff is pretty damn easy, and you probably won’t be dying a whole lot up until the Luncheon Kingdom. But after then? Things get a bit harder. The Luncheon Kingdom, Bowser’s Kingdom and parts of the final kingdom are pretty damn tough, and the postgame adds hundreds of tough Moons to every kingdom in the game. Add to this the tricky mini games, regional coins you probably won’t find without a guide and hint art that can border on the obtuse, and you’ve got a pretty damn tough game to finish. Especially if you’re not reading a guide as you play. All in all, it’s a game with a ton of content and an almost unlimited amount of replay value. What more can you want? In conclusion, Super Mario Odyssey is an amazing game, and perhaps one of the best Mario titles ever made. With tons of original ideas, fantastic game design and top-notch aesthetics in every way, it’s a title every fan should check out as well as the must have Nintendo Switch game of the year. Buy it now. You won’t be disappointed!